July 2, 2011 was a “free” fishing day in California. This means the benevolent Department of Fish & Game suspended all fishing licensure requirements for twenty-four hours. Always an avid angler, I briefly suspended my fondness of two-fisted avian observation in pursuit of the illusive Rainbow Trout. 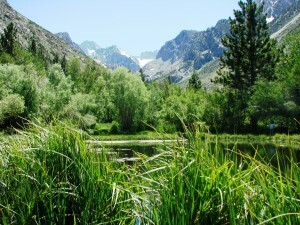 Armed with a new Wal-Mart spinning outfit, a jar of Pautzke’s Balls O’ Fire salmon eggs, a cup of night-crawlers, and a brown bag of crickets, I guided my step-son, John and our families to a pond beside Big Pine Creek flowing from Palisades Glacier in the Eastern Sierra Nevada Mountains. From the moment we arrived at the 8,000 ft. elevation site, I began to have mixed feelings. Stepping from the car into the crisp alpine air, the trills and warbles emanating from the ponderosas and willows were celestial music to my birder’s ears. I gritted my teeth and grasped my fishing pole. Had I been alone at that moment, I probably would have said “Forget fishing, I’m going birding!” But alas, others were counting on my expert angling advice to fill their creels. Crossing the rushing Big Pine Creek on a wooden bridge, we stepped into Elysian Fields. A placid pond, surrounded by towering pines, reflected jagged, snow-capped Mount Galey teemed with rainbow trout, albeit farm-raised plants. It seemed from every tree came the winsome warbles of dozens of avian denizens which I could not immediately identify. “Today I am fishing!” I breathed quietly through clenched teeth. “What’s that?” queried John. “I can’t wait to begin fishing!” I fibbed. I was longing for my camera and two-fisted binoculars. Planting our wives in camping chairs in the shade of a willow, John and I flipped our lines into the pond and soon we both had deposited shimmering rainbows into the ice chest. The songs and calls from the treetops seemed to intensify as my desire to fish waned. After icing a few more rainbows, I excused myself to take a short hike upstream for some riffle fishing. Big mistake! Armed with a fishing rod instead of the accoutrements of birding, I crossed a meadow filled with Wild Iris in full bloom, an idyllic photo-op with the snow-capped peaks of the Sierra Nevada in the background. How I longed for my camera! I wasted several more salmon eggs in the rushing riffles and then hiked back to the pond where John had caught several more trout. The avian serenade above continued stirring my birding instincts. Tired of the easy pond, John wanted to try another location so I reluctantly acquiesced and we headed down the mountain to Taboose Creek, an alpine stream meandering through the prairie among towering cottonwoods with boughs atwitter with singing birds. Agonizingly ambivalent, I cast my line in and soon hooked a monster trout. The thrill of angling raced through my veins again, but alas, the lunker spit out my hook and my sinker sailed past my head. From somewhere overhead I heard the rat-a-tat of a woodpecker. “Pileated?” I wondered. I longed to wander through these woods searching the branches for birds, but instead, I re-baited my hook. Much later, in the gloaming as I arrived home in California City with a copious catch, my heart yearned to re-visit Big Pine Creek, beneath the Palisades Glacier, next time with a camera and binoculars; birding, not fishing. This entry was posted on Tuesday, July 5th, 2011 at 8:23 pm	and is filed under Guest Essays. You can follow any responses to this entry through the RSS 2.0 feed. You can leave a response, or trackback from your own site. You’ve now convinced me you’re the real deal because birding is where your heart truly is.